I first made this simple, but oh so tasty, chocolate cake when Josh and Ben were little. It's now turned out to be one of their favourites. It's the recipe that I use for some of my chocolate cupcakes, which gives a rich, fluffy sponge. The chocolate ganache icing is also richly flavoured, so taken together, you get a whole mouthful of chocolatey goodness. It's been used several times as a birthday cake and school fair baking stall contribution, and has never failed to deliver eager smiles and requests for more. The cake itself is quite easy to make. You can use the 'all in one' method and simply chuck everything into a bowl and blitz with a handmixer. I have tended to use a slightly different method, creaming the sugar and butter well first, as I think this helps the sugar - which can be quite lumpy - to dissolve and makes for a fluffier sponge. The chocolate ganache icing is just chocolate and cream, melted together and then left to cool until you get a spreadable consistency. I could eat this by the spoonful, but Josh and Ben tend to get there first! Preheat the oven to 155 Fan / 175 Conventional / 350 C / Gas 4. Grease and base line two 20cm (8 inch) round cake tins. To make the icing, break the chocolate into bite sized pieces and place in a bowl. Add the cream. Place the bowl over a saucepan of gently simmering water, taking care that the water doesn't touch the bottom of the bowl.Stir while the chocolate melts. Once it is silky smooth, remove from the heat and allow to cool so that it thickens. To make the sponge, place the sugar, salt and butter in the bowl of a stand mixer. Beat until soft and fluffy (about 3-4 minutes). Add the flour, baking powder, cocoa, eggs and milk, and starting the mixer on slow, beat until well mixed. Spoon the mixture equally into the tins and then level the top. Bake in the oven for 20-25 minutes until risen and springy to the touch. Leave to cool in the tins for five minutes, then turn out onto a baking rack, peel off the greaseproof paper, and allow to cool completely. To assemble, spread some icing on the top of one of the cakes, and carefully place the second cake on top. Spread the rest of the icing over the top of the cake (I then added some chocolate sprinkles). You could make a little more icing and cover the sides of the cakes too, if you like (you'd probably have enough using 200g chocolate and 200ml cream). As this month's Tea Time Treats challenge is based on Cake Stall Cakes and Bakes, I'm submitting this to this month's host, Karen at Lavender and Lovage. 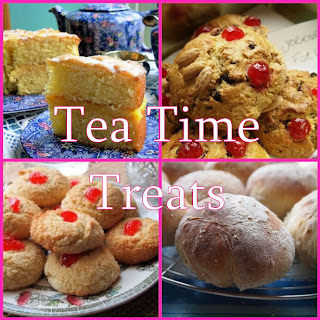 Tea Time Treats is organised by Karen and also Kate of What Kate Baked. The closing date is 28 July, after which Karen will produce a roundup. If the entries so far are anything to go by, I think it may be a very chocolatey month! Oh, I do enjoy a slice of chocolate cake! And I agree- it would be super super popular at any cake stall! Thank you so much for entering TTT! This is something I will never outgrow - my absolute favourite, chocolate cake. I am always trying different recipes to see which one I like best, I will try yours next. Cheers for the recipe, this cake is beautiful! You just can't beat a chocolate cake, I love how moist yours look and that ganache is calling out my name! This looks like chocolate heaven. I bet you got a lovely, rich waft of chocolate when you lifted the glass lid off the cake plate! I'm not really a massive fan of chocolate cake but the simplicity and class of this one is really calling to me. Stunning photos as usual! oh yes - a big slice please! Your chocolate cake looks so yummy.